The Type 83 (also known as WM-40 in its export name) 273mm 4-tube multiple launch rocket system was introduced by NORINCO in the late 1970s. 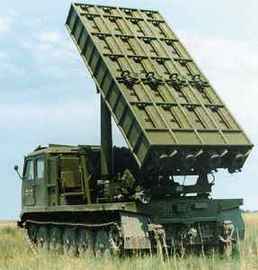 It is China’s first large-calibre, long-range artillery rocket system. The weapon saw limited service with the PLA ground forces before its production was fully stopped in 1988. The free rockets are launched from the launch rails inside a box-shape launcher, and are stabilised by tail fins and high-speed spin generated by a spin motor. The Type 83 can be found in the independent artillery divisions directly controlled by the military region command. The 273mm rocket was also used as a target drone to simulate enemy cruise missiles in PLA air defence exercise. The rocket system is carried by a Type 60-I tracked chassis with five large road wheels on each side. The launcher is mounted on a electrically operated turntable but requires manual operation for accurate adjustment. The launcher has an elevation range of 5.5° to 56° and azimuth range of -10° to +10°. There are two hydraulic stabilisers at the rear of the vehicle, which can be lowered to the ground to provide a more stable firing platform.